When deciding which lawyer will best represent you, experience and training means something. My AZ Lawyers have the expert training and experience in the area of Arizona Bankruptcy Law and Debt Relief. Having experience and knowledge of the law allows the lawyers to better prepare to represent you. It also helps the attorneys to get you the best possible outcome for your particular case. My AZ Lawyers protects the rights of their clients and always makes decisions based on the best interest of the client. Life has a way of turning and changing unexpectedly, so when you need an attorney to fight for you, My AZ Lawyers will take care of representing you, your rights, and your needs. If you are in need of legal assistance, don’t choose just any attorney: you have too much to lose not to retain the services of My AZ Lawyers. Call to contact an attorney at the firm. 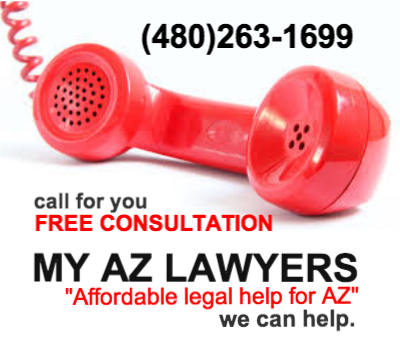 My AZ Lawyers offers a FREE consultation with no obligation. Also, My AZ Lawyers makes expert legal representation affordable for Arizona. Ask about our payment options and our “file now, pay later” plan. My AZ Lawyers is dedicated to fighting on behalf of its clients with their best interests in mind. The attorney’s training and experience makes them experts in their practice and successful in getting a desired outcome for your case. My AZ Lawyers’ team will be with you throughout the entire debt relief process, from the initial consultation until the very end of service.